When the Rubberbandits sing about their “horse outside”, they may be giving horse owners some good advice. Competitive and thoroughbred horses are prone to respiratory problems, due to the high levels of dust inhaled during long hours in stable. However, a Co Galway company has developed an affordable and simple application to keep their airways clear. 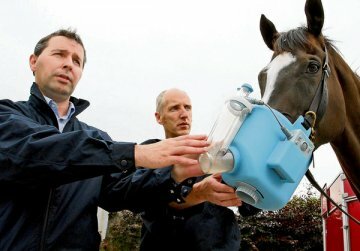 The equine nebuliser designed by Nortev, a veterinary medical device company in Claregalway, Co Galway, has already secured export markets in Britain, France, Germany, Switzerland, Belgium, Sweden and Australia. The company also hopes to start exporting to north America. Corkman Gavan O’Sullivan came up with the idea, along with his business partner, Declan Moran. Both had worked on human nebulisers with medical device company Aerogen. “Competitive and thoroughbred horses are fine when they are out exercising in the fresh air. But the stable environment isn’t ideal and their respiratory system is particularly complex due to their long necks,” Mr O’Sullivan said. The Flexineb equine nebulisation device fits on to the animal like a muzzle and can be topped up with medication. The firm employs eight people and is supported by Enterprise Ireland and AIB Seed Capital Funding. Galway-Mayo Institute of Technology’s innovation in business centre also assisted, Mr O’Sullivan said.